'Brown Duet' (Raymond G. Smith, R. 1970). Seedling# 6764AR. TB, 34" (86 cm). Midseason bloom and rebloom. Standards yellow-orange (Munsell 2.5YR 5/9); falls darker (2.5YR 4/7); orange beard. 'Rum Jungle' X 'Renaissance'. R. G. Smith 1971. 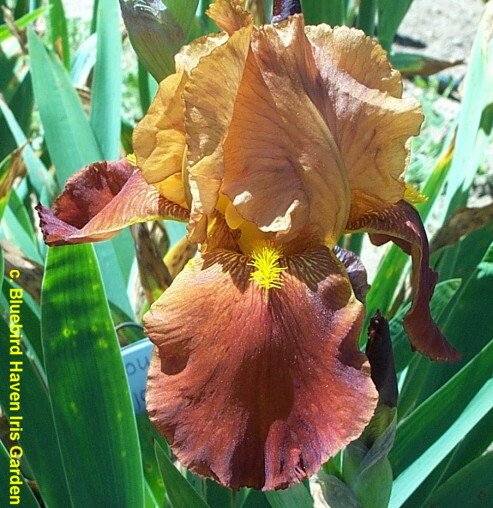 From AIS Bulletin #201 April 1971 Introducing BROWN DUET (Rum Jungle x Renaissance) Large, well-branched brown self. Has rebloomed well in Belvidere, Ill. $25. Raymond Smith.